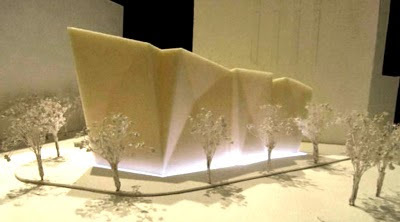 A new ‘crystal palace?’ When I first saw the architectural model of a proposed structure in New York City, I thought the model was made of salt. Turns out, its actually a futuristic building to house salt. Howie G. sent me this tip about the controversial road salt shed. I love the design. Why not be imaginiative with architecture even if it has a mundane purpose? Too often, we throw up the most boring municipal structures just to save a buck. Most people know these normally utilitarian salt building as they pass them on a highway. Whereas, here Architect Mike Friedlander envisioned a sodium shack modeled after angled salt crystals. Granted, the cost is $10 million, but this unique building won’t melt in the rain. What do you think of unusual architecture for common structures?